Botox and fillers are not new, but we usually associate these injectable treatments with facial rejuvenation. Now, they are also being used to fight wrinkles elsewhere on the body. Your neck, for instance. Neck wrinkling is most often a result of aging. Over time, and with exposure to the sun, our skin loses elasticity. Some people also lose fat in the neck area, which further contributes to sagging skin. The result is horizontal lines and wrinkles. Neck wrinkling may also be a sign of the times. The term “tech neck” was coined to define wrinkles that develop when we repeatedly (and for extended periods) look downward at our smartphone or some other device. Then there are the vertical bands we often see that run from the base of our chin down toward our throat. You may think these are just another type of skin wrinkle, but in fact these bands are caused by contraction of the platysma muscle. This muscle is a broad and thin, like a sheet. It starts down by the upper portion of your pectoral muscles and runs upward, over the clavicle, to your jawbone. It helps control certain lower jaw movements, such as when we talk or eat. Like skin, over time, the platysma muscle loses elasticity – and that’s when those parallel bands begin to show. What can Botox do for neck wrinkles? We use Botox to reduce the vigor of muscle contractions that cause facial skin to wrinkle (and leave telltale lines and furrows over time). 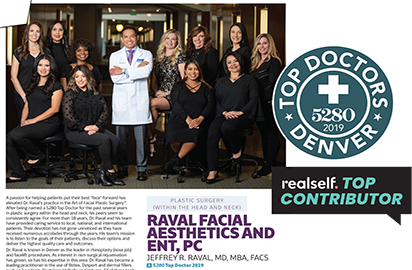 Dr. Raval says Botox injections can work similarly on the neck, helping reduce the appearance of vertical banding by relaxing the platysma muscle. Botox injections work for mild to moderate banding. As with all Botox procedures, treatment sessions take just a few minutes. In most cases, results can last from 12 to 18 months before a refresher treatment is needed. What can dermal fillers do for neck wrinkles? We use various types of dermal fillers to re-plump wrinkled or sagging skin by literally filling in the gaps from underneath – replacing lost fat. It seems that would work just as well on your neck as on your face. And it can help with horizontal neck wrinkles, says Dr. Raval. However, experience has shown that as you turn your head the filler doesn’t necessarily follow smoothly. In some patients, that can result in visible “lumps” of filler. So, when it comes to dermal fillers, treating neck wrinkles is still a work in progress. And if you want to correct both vertical banding and horizontal wrinkles, a neck lift remains the best solution. Surgery also provides a permanent solution, whereas Botox and fillers are temporary, requiring periodic renewal to maintain the younger look. If you don’t feel ready for a neck lift, Dr. Raval recommends laser peel to address wrinkles and sun damage on the neck. Here at Rocky Mountain Laser Aesthetics, we offer a Microlaser Peel, which is an excellent choice for skin rejuvenation that provides immediate results. The procedure doesn’t take much time, and there is virtually no discomfort. We also offer our Triple Peel treatment, which combines the Microlaser Peel with IPL and ProFractional treatments for a three-in-one session. Results are even more noticeable, but there is a little downtime. Are Botox or dermal fillers right for you, or would another option be the best solution to smooth your neck? A personal consultation is the best way to find out.